It seems the UK population is tooling itself up ready to deal with the violence on the streets. 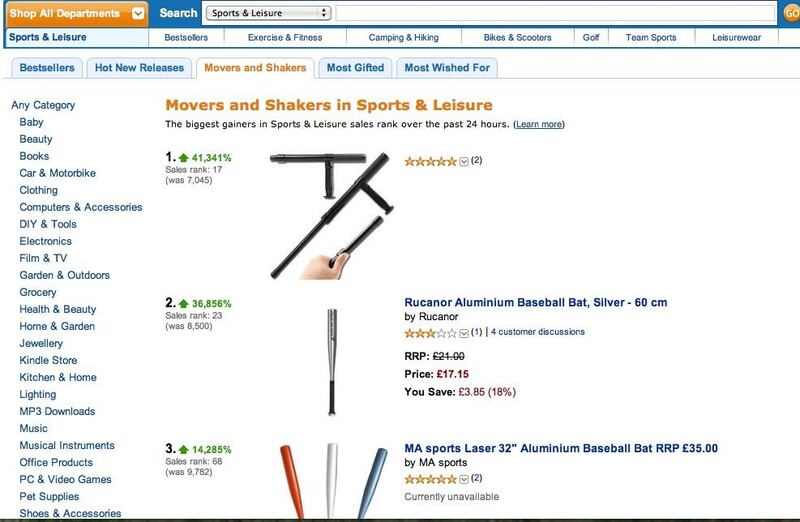 A look at Amazon.co.uk's movers and shakers (the biggest increase in sales over the past 24 hours) in sports and leisure has 10 of the top 20 spots going to baseball bats. The top baseball bat's sales increased by 36,856% taking it from a sales ranking of 8500 to 23 in a single day. 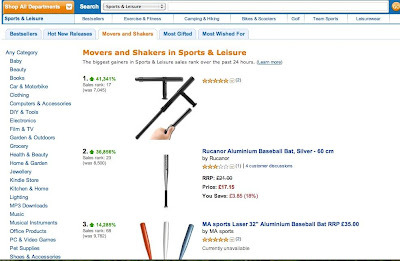 The top seller however is a natty expanding police style baton which saw sales increase by a staggering 41,341% in 24 hours; a leap in sales rank from 7045 to 17. Another spot went to the Kubitan and another to the Pocket Shark pen which are both self defence weapons. I assume it is the good guys buying all this stuff as the bad boys would just loot it!